Sabourin, Diane. "Château Frontenac". The Canadian Encyclopedia, 08 July 2016, Historica Canada. 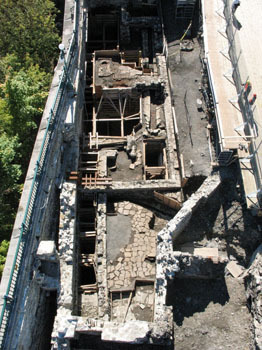 https://www.thecanadianencyclopedia.ca/en/article/chateau-frontenac. Accessed 20 April 2019. View of Château Frontenac from Terrasse Duferrin by Mélanie Fafard (2013). 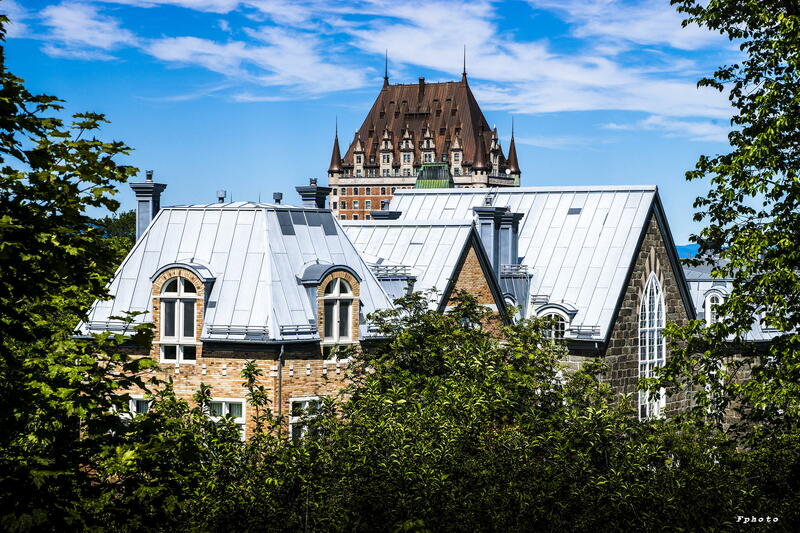 The Château Frontenac in Québec City (Price, 1892-93) began a tradition of château-style railway hotels that became a distinctively Canadian architectural form (photo by Michel Gagnon/CUQ Communications). Château Frontenac and the fortifications. 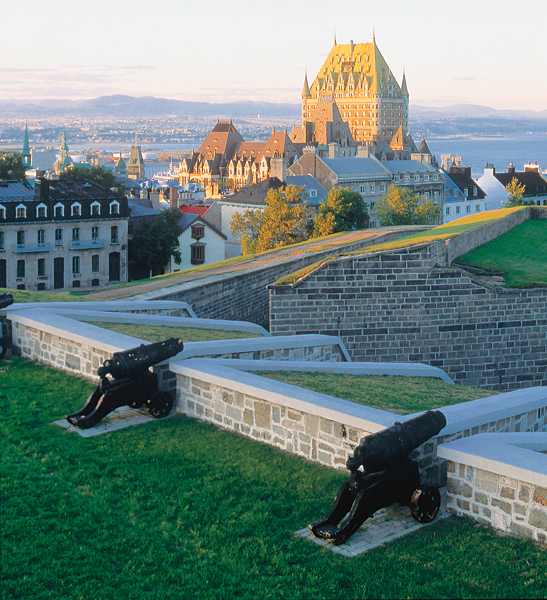 Credit: Luc-Antoine Couturier, Quebec City Tourism. Built by Canadian Pacific beginning in 1892, and designed by architect Bruce Price, the Château Frontenac is an excellent example of château-style hotels developed by railway companies in Canada. 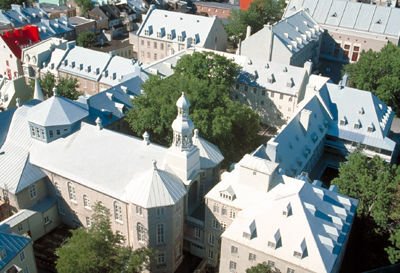 Located in historic Old Québec, it was designated a National Historic Site in 1981. 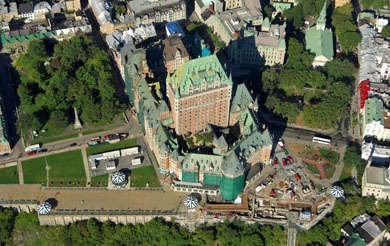 Construction on the Château Frontenac Hotel began in 1892. New York architect Bruce Price, designer of Montréal’s Windsor and Viger Stations and inspired by French castles drew up the plans. The Canadian Pacific Railway Company headed by William Van Horne undertook its construction. The prestigious hotel takes its name from Louis de Buade, Comte de Frontenac. A key figure in New France history, Frontenac was the governor of the colony from 1672 to 1682, and again from 1689 to 1698. He is recognized for having defended the colony against British and Iroquois attacks. 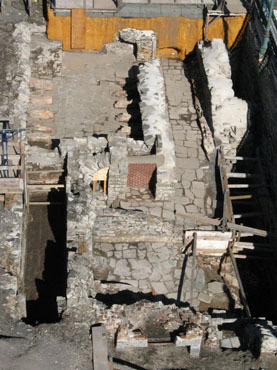 The Château Frontenac was built near the Citadel on which Frontenac had begun construction in the late 17th century. It covers the Saint-Louis Forts and Châteaux archeological site. Situated on a large cape (Cap Diamant) it overhangs the St. Lawrence River and runs alongside the celebrated Plains of Abraham historic site where the battle for the conquest of Québec took place in 1759 during the Seven Years’ War between Great Britain and France. This magnificent hotel opened its doors in 1893. The directors of the railway society wanted to encourage luxury tourism, and hoped this would induce wealthy tourists aboard their trains. 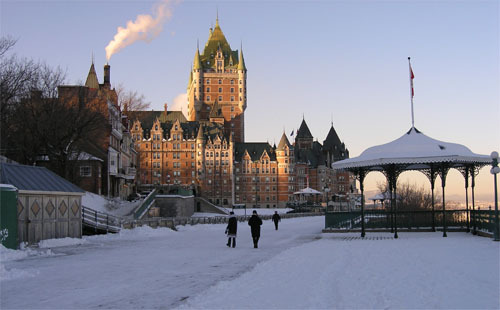 Furthermore, the Château Frontenac was just one of a long series of château-style hotels to be built by the railway company. Several modifications took place during the twentieth century that changed the original image of the Château. 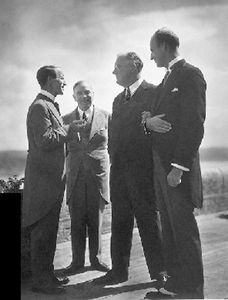 Undoubtedly, the most important was the 1926 addition of the central tower with architects Edward and William Maxwell as contractors. 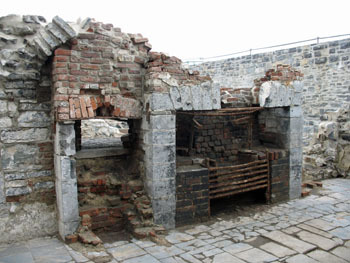 Construction of the Citadel Wing was carried out in 1899 and of the rue Mont-Carmel in 1908. Lastly in June 1993, the Claude-Pratte Wing with its superb interior swimming pool and fitness centre and a magnificent exterior terrace was inaugurated. Frontenac’s coat of arms can be found on the exterior wall of the entranceway arch and at various other places in the hotel. On the vault of the entrance hall discerning visitors can admire the 350-year-old stone emblazoned with a Maltese cross. 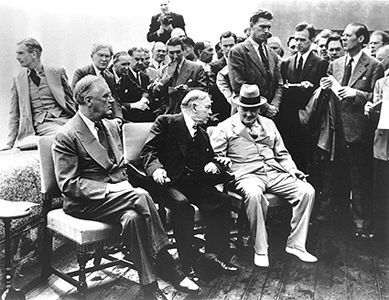 Many dignitaries have honoured the famous hotel with their presence: Charles Lindbergh, Charles de Gaulle, Alfred Hitchcock and representatives of the British Royal family to name but a few. Québec Premier Maurice Duplessis (1936 ‒1939; 1944‒1959) lived at the Château Frontenac during his mandates. 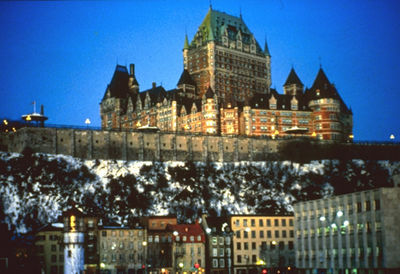 A number of important events took place at the Château Frontenac. 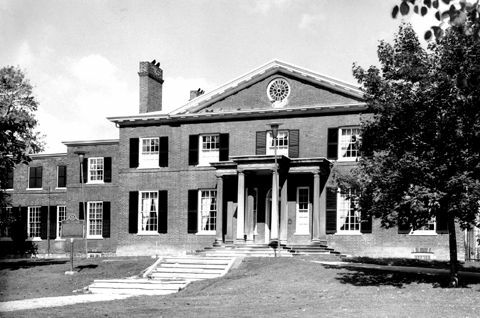 It hosted the two Québec Conference (August 1943) and (September 1944) at which the Allies discussed Second World War strategies. Almost all the members of the Allied delegation were housed there. 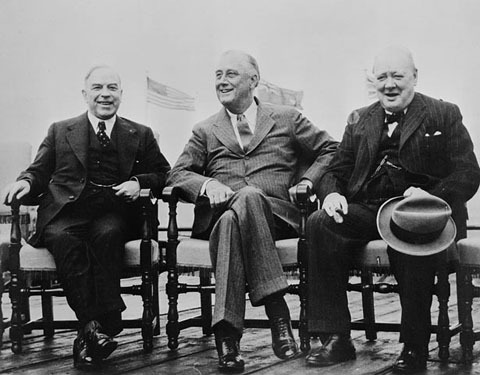 It was in Château Frontenac that Mackenzie King met British prime minister Winston Churchill and American president Franklin D. Roosevelt to finalize Italy’s surrender. They met again in 1944 to work out the end of the war. The Food and Agriculture Organization (FAO) was founded there in 1945. The Château Frontenac has received several awards and honours including a Four Diamond designation from the CCC/AAA and one from Expedia Insiders’ Select as one of the world’s best hotels. There is no doubt that its European charm, 611 luxurious rooms and the gastronomic skills of Chef Jean Soulard (head of the Château kitchens from 1993 to 2013) enabled it to obtain these distinctions. Considered as the world’s most photographed hotel, the Château Frontenac is a cultural monument associated with Québec’s history and a historical jewel designated a World Heritage Site by UNESCO. A symbol of Québec City, it is operated by the Fairmont Hotel chain, and welcomes visitors from around the world to share not only its splendid location but also its many centuries of history. In 1981 Château Frontenac was formally recognized a National Historical Site of Canada. On 14 June 1993, Canada Post issued a commemorative stamp depicting the hôtel. France Gagnon-Pratte, The Château Frontenac (Québec : Éditions Continuité, 2014). 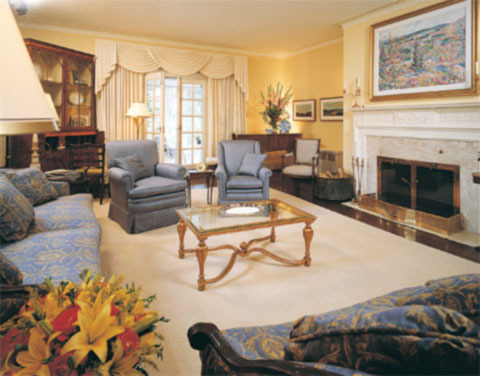 FAIRMONT LE Château FRONTENACA brief history of the elegant Fairmont Le Château Frontenac in Québec City. Château Frontenac National Historic Site of CanadaThis site highlights the heritage features of the Château Frontenac National Historic Site of Canada. 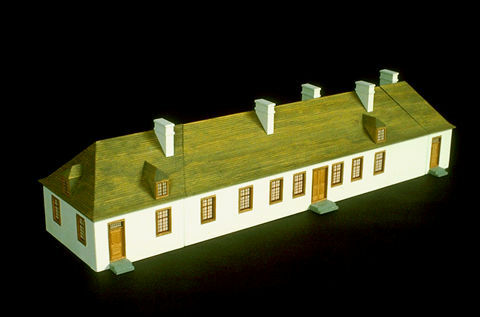 From Canada’s Historic Places website. Château FrontenacHistoric photos of the Château Frontenac. Text in French. Fairmont Le Château FrontenacContemporary photos of the glamerous interior spaces of the Fairmont Le Château Frontenac. From the website ivanhoecambridge.com. QUÉBEC CITY AND AREAVisit the official website of the Québec Tourism Office. Château FrontenacA 1981 video feature about the history of the Fairmont Le Château Frontenac. From Radio-Canada. In French.